1 | What is the status of mini grid development and support in each country? 2 | Where are there gaps? · Technology Costs Ghana, Kenya, Maldives & 3 others? Objective: Provide hands-on training for individuals interested in using the HOMER® Pro software to assess and optimize alternative mini/microgrid systems. 9:00 – 5:00 Class limited to 20. Interested applicants must apply; prior exposure to HOMER preferred. Dr. Peter Lilienthal, the CEO of HOMER Energy and the original developer of NREL’s HOMER software, will conduct an in-person training workshop in the HOMER Pro software on Monday December 4, 2017. The HOMER (Hybrid Optimization Model for Multiple Energy Resources) Pro software simulates and optimizes the design of hybrid power systems. It analyzes a wide variety of possible system designs to find the least cost system that meets the site’s load requirements given its local resources and prices. The training workshop will begin with an introduction to HOMER covering the fundamental concepts of the HOMER software. Participants will leave with an understanding of the interface and modular design. They will also work simple modeling projects from beginning to end and interpret the results. Participants will learn how HOMER calculates the technical feasibility, economic value, and other metrics of different designs through its powerful sensitivity analyses and its ability to simulate and optimize thousands of system designs in minutes. The afternoon session will cover advanced topics in wind, solar, large systems with multiple generators, small 100% renewable systems, and water pumping applications. This will include modeling multiple solar arrays, using the maximum power point tracker and dedicated inverter, understanding wind data and turbine models, and understanding HOMER’s approach to operating reserves. 10:30 Regulatory Landscape – Implementation of the MG regulations Panel Discussion: NERC official -Comm. Dafe, – overview; Private sector developer; Disco; and community stakeholder; Moderated by ? 3:45 DiSCos – Opportunities for Collaboration Panel Discussion: DISCos – Kaduna and Kano, others? Community engagement Aaron Leopold, Practical Action/digital green videographing (India)/Energia/ OMC or GVE, Arnergy, Gram Power (india)/ SriLanka DfCD bank/Bangladesh (Pavel)?/ Quicksand. ▪ What financing mechanisms will allow minigrids to scale? ▪ How can we rapidly train skilled labor for solar O&M? ▪ How can we coordinate different funders and types of financing into more platform-based finance? ▪ How can we ensure that investors and financiers are keeping commitments (e.g., local job creation, ethical working conditions), and that donors are consistently acting in the best interest of Nigeria/REA? ▪ What consumer affordability mechanisms can be deployed (e.g. payment structures, vouchers for the extremely poor)? ▪ How can we improve consumer awareness and trust in solar? ▪ What innovative financing models can be deployed for solar home system companies (e.g. results-based financing)? ▪ How can we unlock and scale mobile money and consumer finance for solar products? § What can we do to ensure good O&M of the future plants? § How can we increase awareness within the Universities for the need to save energy? What are sustainable mechanisms to allocate the power and energy within the universities? How can we apply lessons learned from other solar IPP projects? § What can we do to promote a successful bidding process? Day 4. Fri, Dec 8, 5:30 am | Field Visits Limit: 100 participants; Distance: 3.5 hrs. 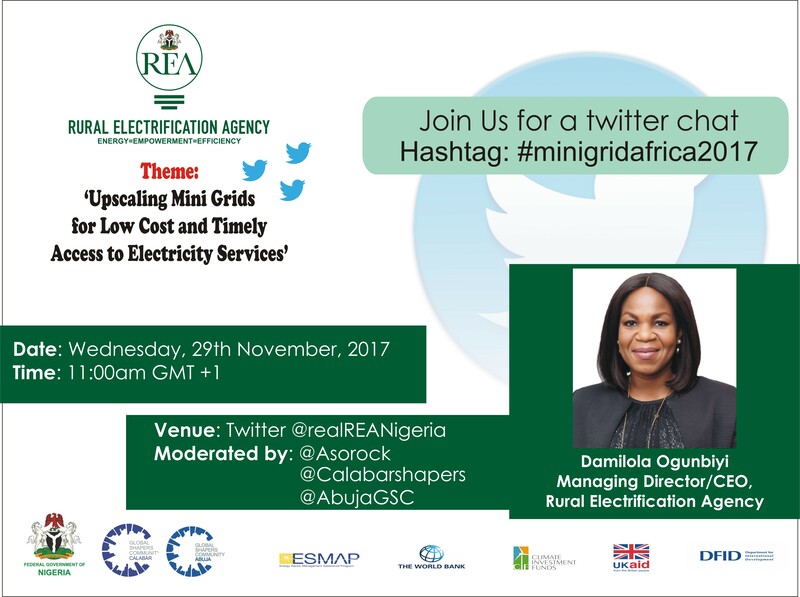 Objective: To visit an operating mini grid facility, learn about the construction and operation, and talk to its customers about the benefits. Participation limited to100 individuals. The Community: Bisanti is a landlocked community located in Katcha Local Government Area of Niger State Nigeria. The community has about 200 houses, and agriculture and petty commercial activities are its prevailing economic drivers. The community is serviced by a school, health centre, corps members abode, a security post (local vigilantes) and mosques, but lacks portable telecom access. A handful of the inhabitants have access to electricity through petrol-powered generators, while the rest are at the mercy of kerosene lamps, candle lamps, firewood etc. Project Description: In July 2015, GVE Projects Ltd in collaboration with the Bank of Industry Nigeria (BOI)/ United Nations Development Program (UNDP) and the Institute of Electrical Electronics Engineers (IEEE) announced the implementation of a 24kW PV solar based mini-grid pilot project. The project was aimed at field testing the technical and commercial viability of adopting renewable energy for off-grid rural electrification. The project created 60 direct and indirect jobs during the course of implementation while creating an estimated N2.75million ($13,000.00) in wealth in the beneficiary community through construction, survey, labor and other related expenditures. The initiative has a very sound financial model based on a pay-as-you-go platform and is very reliable yet extremely affordable to the low-income rural dwellers. The project was completed within 3 months. Project Cost: The project’s total cost of $250,000 was financed 90% by Bank of Industry Nigeria through equity and debt financing and a 10% grant support from the IEEE.